LSVT Global helps clinicians administer its LOUD® speech therapy for patients with Parkinson's Disease and other neurological conditions with this custom mobile application by DDA. See the LSVT LOUD® Android App in the Google Play Store. LSVT Global developed a new effective speech treatment for individuals with Parkinson Disease and other neurological conditions, who often struggle to be heard due to their conditions. The therapy is administered over 16 sessions in a single month, four sessions per week, combining sensory awareness training, motor learning, and skill acquisition. Speech intelligibility are maximized through improving respiratory, laryngeal, and articulatory function. While most studied among those with Idiopathic Parkinson Disease, the LSVT LOUD® program has also been administered to those with cerebral palsy, stroke, Down syndrome, multiple sclerosis, and stroke. 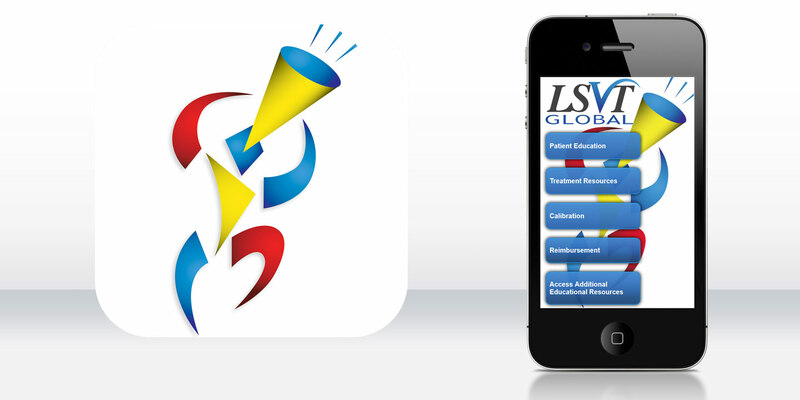 LSVT Global wanted to create a new mobile app that would help both clinicians and patients as they went through the LSVT LOUD training program. The application would be compatible with both Apple iPhone® and Android™ smartphones. The application would be designed with large buttons and font to make it easy to use for the mainly older demographic that would benefit from its deployment. The resources are divided into five main sections, including two section linking to online resources. One resource links to reimbursement codes for the LSVT LOUD treatment to be used by clinicians at billing. Patient Education includes large colorful visuals to help patients understand the objectives of the LSVT LOUD treatment program, and to better understand the degree of effort they will need to put into speaking in an intelligible manner in order for that outcome to be achieved. Other resources include a breakdown of time use in each session, the skills to be developed in the program, a calendar outlining the specific lessons for each session in the four-week program, and a homework log that allows each clinician to keep notes of the work they assign to patients. Since the LSVT LOUD program is proprietary, DDA built password protection into the app that requires use of a program certification number to access the clinician-only resources. An administrative area allows the client to update these numbers at any time. The final mobile applications were added to the Apple iTunes® and Google™ Play stores, and will be sure to help clinicians and patients alike as they work together on the LSVT LOUD program and reestablish patients’ ability to connect through oral communications to those around them once again.